APM's 2019 Spring Gala, honoring Dr. Karen R. Hitchcock. 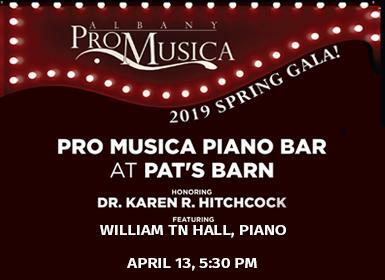 Mark your calendars for Saturday, April 13, 2019 as Albany Pro Musica presents our 2019 Spring Gala - Pro Musica Piano Bar! This year APM will bring a New York City Piano Bar right here to Capital Region! The evening kicks off at 5:30pm at Pat's Barn in the Rensselaer Technology Park with piano bar themed drinks and appetizers, followed by performances from the very talented singers of APM! After a delicious sit down dinner, the event transforms to a very engaging and entertaining NYC Piano Bar where you will feel like you are in the heart of Broadway! And, tickling the ivories for the evening is composer, entertainer and headliner from the NYC Piano Bar scene, William TN Hall! To make our special evening complete, we cordially invite you to help us celebrate and honor our 2019 Honorary Gala Chair, Dr. Karen R. Hitchcock. Dr. Hitchcock's commitment to expand the choral arts - an art form that transforms audiences and reaches new generations - has impacted thousands and we are thrilled to be honoring her heartfelt and impressive work! Space is limited and tickets for this gala will go fast, so make sure to lock in the date now and to keep a look out for the invitation!